This 1967 Pontiac GTO convertible was shipped new to Vince Whibbs Pontiac in Pensacola, FL, and held an original MSRP of $3,921.91. This well-optioned GTO convertible was ordered from the factory with a Turbo-Hydramatic transmission, Hurst Dual Gate shifter, push-button radio, dual-stage air cleaner, visor vanity mirror, remote-control outside mirror, luggage lamp, under-hood lamp, ignition-switch lamp, custom front and rear seatbelts, center console, electric clock, power steering, power brakes, tilt steering wheel, Soft Ray glass and front and rear mats. The car comes PHS paperwork along with a reproduction Window Sticker. The previous owner commissioned a no-expense-spared complete professional restoration that incorporated many NOS parts, including added air conditioning. 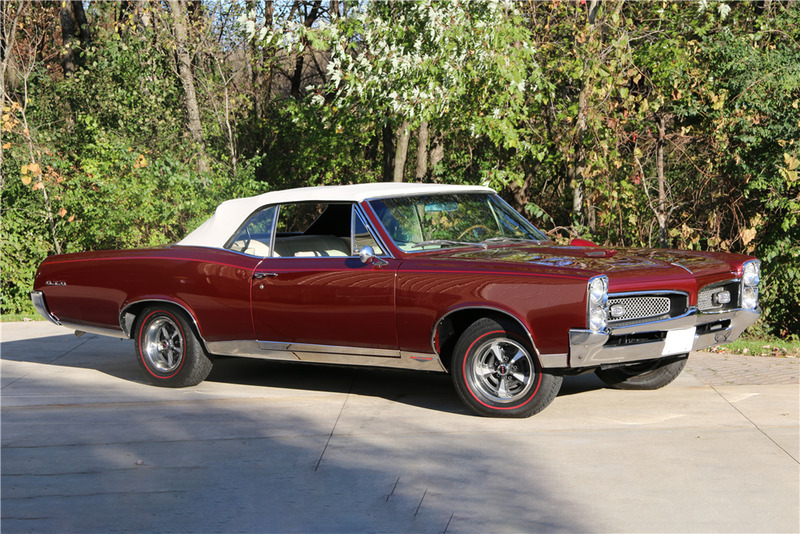 This GTO retains its beautiful original color combination of Burgundy with Parchment interior and retains all of the original sheet metal, original 400ci V8 engine, original automatic transmission and original rear end. Since the restoration the car has won many awards (awards are not included). This GTO has recently been completely serviced and sits on correct Pontiac Rally II wheels with new red line radial tires.